The video was a great idea. It looks like the big white ceramic resistor (left one of the pair) is cracked and has discoloration at 0:11 of the video. There could be some stored DTC in the EV-ECU related to the charger, but it seems like the dash would show a trouble light. There are about 26 internal on-board charger trouble codes that get flagged up to the EV-ECU. i put a list of these and the EV-ECU DTCs in the troubleshooting thread. Does the charging indicator lamp come on or blinkk when you try to charge? 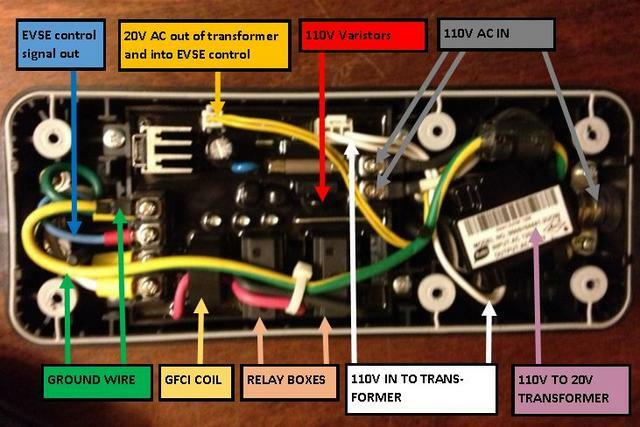 When you plug in the level 1 EVSE, what color LEDs come on or blink? Does it appear normal or does the fault (red) led come on? The iCarsoft i909 obdii scanner can read and clear DTCs, read CAN buss data, etc it is not as powerful as a MUT3 but it is a handy tool. Last edited by kiev on Tue Jul 03, 2018 8:51 am, edited 1 time in total. The charge light blinks when I plug in. I’ll open it up again tonight and photograph that component more closely. I’m really glad you saw that. I was quite disappointed when I couldn’t see anything wrong. And there is no error light when using l1. Again I’ll check the exact sequence of the lights this evening if that’s helpful. The part # is obscured by the potting and it’s proximity to the 2nd resistor beside it. So... any guesses as if this could be the cause of the charging problem or if it is a result of another problem? And suggestions as to where to have this repaired? Yes it could be causing a no-charge situation if the resistor is cracked thru and causes an open-circuit condition. My guess is that is in the AC feed path to/from the relay to the diode rectifier bridge, but i haven't received the charger from jray yet in order to trace all the circuits. That bottom board will need to be removed in order to access the solder joints on the bottom that hold the resistor. 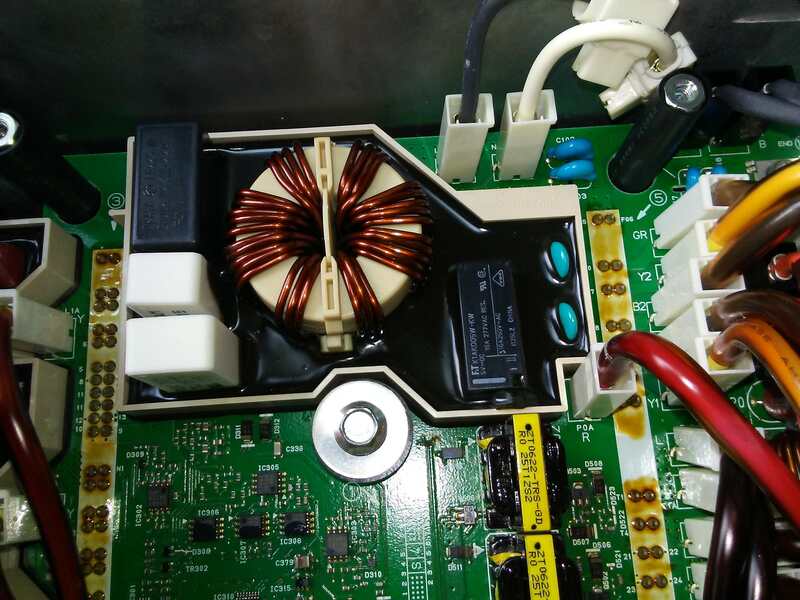 edit: There are some high current devices mounted below the bottom board against the liquid-cooled heatsink--those are what i think the solder joints are connecting. Last edited by kiev on Sun Jul 15, 2018 6:01 am, edited 2 times in total. kiev wrote: That bottom board will need to be removed in order to access the solder joints on the bottom that hold the resistor. ... disassembly step to remove the board and requires all the solder on those top joints to be removed in order to get that bottom board out of the box. Yeah. And I thought Elcon chargers were repair-unfriendly! I had a good look and I don’t see any reason why I can’t remove the unit. I’ll see if I can find someone local to work on the board. Do we know what resistor to order? And where to get it? I appreciate your offer to work on it. I hope someone around here will do it but Its comforting to know that i can send it to you if I need. Thanks again, this forum is full of such fantastic knowledge people. Once we can read the markings on the resistor it will be easy to find the manufacturer and a source to purchase. You can make a spudger tool for scraping off the black conformal coating in the doghouse around that resistor. i use a bamboo chopstick and whittle the end to a flat blade (like a screwdriver tip). The coating is soft, flexible and easily cut and pushed off with the stick, and the wood will not damage anything that might be hidden below the surface. 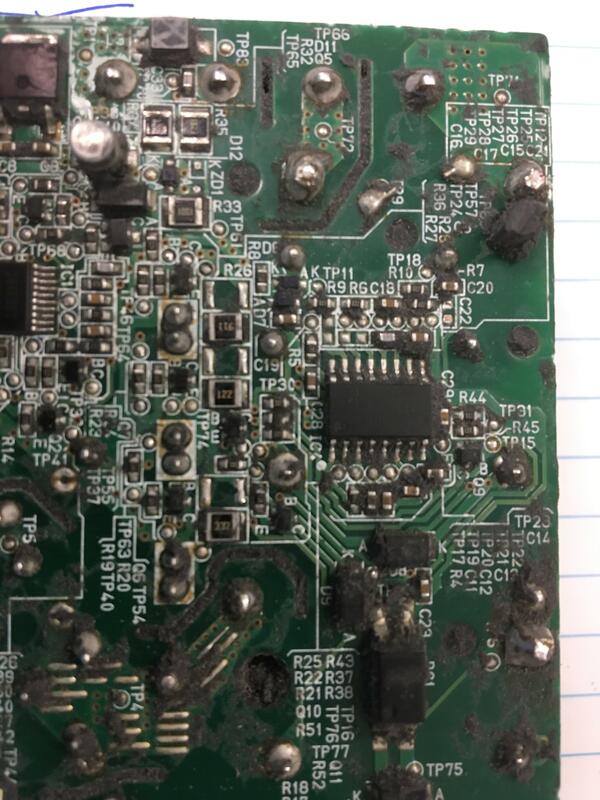 Here's an example from the Level 1 charging EVSE unit that came with our cars showing the before and after chopstick treatment for the control board. I've used Kenny's chopstick technique (edit: suggested by Kenny) many times on Elcon chargers, which have a thinner coating of what appears to be a similar potting material. I can attest that it works well! Kenny, have you found a source for a replacement for this potting mix? I usually use a spray-on PCB lacquer, but it doesn't look anything like the same, and there may be advantage in Mitsubishi not noticing glaring changes, in the admittedly unlikely event that they take the cover off any module (rather than replacing the whole thing with a new module). Whatever was used, it would have to be rated for at least 400 V, not have an acid cure, etc. Something like the silicone that you can get in tubes for caulking guns, but runny. I've had a half-hearted look at our local hardware stores, with no luck so far. Edit 2: Plus, actual potting mix would look so much better than a clear coating, and it would mechanically protect the larger parts from vibration. at least to a degree. Also, we've been assuming that the potting is of the rubbery / silicone kind. Some are really hard, and have to be melted off. Do we know for sure that it's the rubbery kind? I’ve found someone in my local area who can replace the resistor so I’m removing the inverter at the moment.